When you are diagnosed with cancer, nutrition becomes even more important. Good nutrition can help you feel better, reduce the risk of infection, keep your strength up, and help you heal faster. Maintaining a healthy body weight and your body's store of nutrients can help you tolerate treatment-related side effects as well. All nutrients are good for you and will help. Protein is important for growth, to repair body tissue, and to keep our immune systems healthy. Not getting enough protein can slow down healing and break down muscle for fuel causing weakness. Extra protein may be needed for patients undergoing chemotherapy, radiation and surgery. Some sources of lean protein are beans, nuts, seeds, chicken, fish, turkey, meat, dairy and lentils. Yes fat is important! Fats and oils are made of fatty acids and serve as a rich source of energy for the body. When fat breaks down, our body uses it to store energy, insulate the body and transport vitamins. There are many different types of fats and some are better than others. Monounsaturated fats are found mainly in vegetable oils like olive, canola, and peanut oils. They are typically liquid at room temperature. Monounsaturated fats can help reduce bad cholesterol levels in your blood and lower your risk of heart disease and stroke. They also provide nutrients to help develop and maintain your body's cells. Polyunsaturated fats are found mainly in vegetable oils like safflower, sunflower, corn, and flaxseed. They are also the main fats found in seafood. These fats are high in omega 6 and omega 3 which can play a crucial role in brain function and in the normal growth and development of your body. Saturated fats are mainly found in animal sources like meat and poultry, whole or reduced-fat milk, cheese, and butter. Some vegetable oils like coconut, palm kernel oil, and palm oil are saturated. Saturated fats can raise cholesterol and increase your risk for heart disease. Less than 10% of your calories should come from saturated fat. Trans-fatty acids are formed when vegetable oils are processed into margarine or shortening. Sources of trans fats include snack foods and baked goods made with partially hydrogenated vegetable oil or vegetable shortening. Trans fats also are found naturally in some animal products, like dairy products. Trans fats can raise bad cholesterol and lower good cholesterol. Try to avoid these products. This is the nutrient I find most people scared of and try to avoid. CARBS ARE GOOD FOR YOU!! It just depends which ones you are talking about. Carbohydrates are important for energy; they give the body the fuel it needs for physical activity and proper organ function. "Good Carbs" are fruits, vegetables, and whole grains. "Bad Carbs" are simple sugars like cookies, cakes, candies, and sugar drinks which provide little nutritional benefit. Water, water, water and did I say water, is extremely important to drink. All your cells need water to function properly. If you are experiencing some side effects like diarrhea or vomiting, you want to make sure you're staying hydrated to prevent dehydration which can be dangerous. Drinking eight 8oz glasses of water a day is suggested. Some of the food you eat like soup, ice cream and milk contain fluid which can be used toward your fluid goal. If you don't like the taste of water, you can always flavor your water with fruit. I like to add a mango peel or sliced strawberries to a pitcher of water. Now I have flavored water with no added calories or artificial sweeteners. These are also important for body function. Yes they come in pill form also, but are better absorbed through food. Sometimes if you are not eating well, the doctor may suggest talking a multivitamin. People think the more the better with vitamins; however, vitamins can sometimes interact with treatment so speak with your doctor or registered dietitian before starting any supplements. This is an overview of basic nutrition. All these nutrients are good for you. Remember, your plate should look like a rainbow. The more colors on your plate, the better. Gastric cancer and gastric cancer treatment can cause a variety of nutrition related side effects. Many of these can be managed with the proper nutrition including changes in diet, food selection, and preparation techniques A Registered Dietitian who specializes in oncology nutrition (CSO) can recommend foods, beverages, meal plans and supplements that will provide adequate nutrients and calories for your specific metabolic and caloric needs and help manage your nutrition-related symptoms and side effects through diet. Eat frequent but small meals and snacks. Seek counseling from a registered dietitian (RD) who is a certified specialist in oncology nutrition. Dietitians can recommend foods, beverages, meal plans and supplements to improve your nutrition before, during and after cancer treatment. They can tailor this information to your individual needs, treatments and side effects. Get information from sources that rely on sound, scientific evidence. Avoid "miracle cures" and unknown dietary supplements, most of which do not have evidence to support their use or benefit during or after cancer treatment. If something sounds too good to be true, chances are it is. Changes in appetite are common with gastric cancer and gastric cancer treatment. People with appetite loss may eat less than usual, not feel hungry at all, or feel full after eating only a small amount. Although you may not feel like eating, keep in mind that getting adequate nutrition and maintaining a healthy weight are important parts of your recovery. Take advantage of the times when you have the most appetite and try to consume small frequent meals and snacks throughout the day. Eat in enjoyable surroundings, and make meals look less overwhelming by placing them on smaller plates rather than larger plates. Nausea is sometimes described as an unsettling or queasy feeling in the stomach and can be experienced with or without vomiting. Having an empty stomach may make nausea and vomiting worse, so be sure to eat regular meals and snacks. Eat small frequent meals (5-6 times a day) instead of 3 large meals, and avoid greasy, spicy foods and food with strong odors. Eat foods such as crackers, toast, broth that may be easier on your stomach. Try ginger teas, ginger candies, ginger snaps/cookies, or ginger root in soups. Constipation can be caused by certain chemotherapies, nausea and pain medications, as well as a change in diet or a decrease in your usual activity level. Be sure to stay hydrated. Drink a minimum of 8-10 8 oz. glasses of fluid per day. If allowed, consume foods rich in dietary fiber such as bran, whole grain breads, rice, cereal and pastas as well as fresh fruits and vegetables, beans and nuts. Fatigue is one of the most common side effects experienced by patients receiving treatment for gastric cancer. It is usually described as feeling very weak, tired, or having lack of energy. Choose foods high in protein and calories, which provide lots of energy. Try nutritional supplements or liquid meal replacements if recommended by your physician and healthcare team. Include light exercise if your healthcare team approves as this can also help combat fatigue. Diarrhea occurs when you are having frequent, loose, soft, or watery bowel movements, and can quickly lead to dehydration. Avoid foods high in fiber, greasy, fatty foods, raw vegetables, and caffeine. Be sure to stay hydrated. Drink a minimum of 8-10 8 oz. glasses of fluid per day, water, clear beverages like broth or juices, Gatorade, or decaffeinated tea. Consume foods rich in potassium such as fruit juices and nectars, bananas, and potatoes (without skin) to help replenish the potassium that can be depleted with diarrhea. Consume foods high in pectin and soluble such as applesauce, baked apples, bananas, and oatmeal. Consuming too much sugar in your diet may also contribute to diarrhea and loose bowel movements and it may be helpful to limit high sugar foods as well as added sugars. During gastric cancer treatment foods you usually prefer may become unappealing. You may also find that foods taste bland, bitter or metallic. Try rinsing with 1-2 oz of baking soda rinse before and after meals (recipe for baking soda rinse: 1 quart water, ¾ teaspoon salt and 1 teaspoon baking soda). If red meats taste strange, try substituting other proteins such as chicken, turkey, fish, eggs, dairy, beans, or tofu. Eat foods that smell and look good to you. Avoid using metal utensils; use plastic utensils instead. Avoid hot foods to reduce strong odors, serve food at room temperature. Heartburn can be an uncomfortable side effect of your treatment. It is helpful to avoid acidic foods, like tomatoes and citrus, as well as high-fat and spicy foods. Small frequent meals can minimize acid regurgitation and discomfort. If your heartburn is persistent, be sure to speak with your healthcare team as some patients may be prescribed over-the-counter or prescription heartburn medications by their health-care team. Often it is challenging to follow the correct diet after surgery or when living with a partial or full gastrectomy. After surgery, it is important not to irritate the post-operative area that may be inflamed or healing. 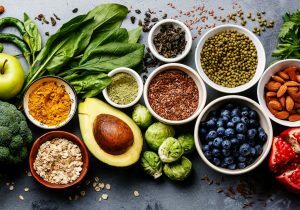 As you begin to heal, there are certain foods that are important to avoid as they may be harder to digest or contribute to uncomfortable digestive symptoms. 3. Limit foods high in sugar/sugar alcohols and avoid added sugars like sugar, honey, syrup, sorbitol, xylitol - These can affect the movement of food through your digestive system and may cause discomfort. 4. Avoid high fiber foods (>2 grams of dietary fiber per serving) such as whole grain or whole wheat breads, rice, cereals, and pastas - It is also important to avoid raw fruits and vegetables and any fruits and vegetables that are not cooked well. For example, even a stir fry with broccoli can be difficult to digest because often the broccoli and vegetables are still firm and crunchy. Certain foods are tough to digest whether cooked or not and should be avoided – including foods like corn, nuts and seeds. 5. Consume low fiber foods (<2 grams of dietary fiber per serving) such as white breads, rice, pastas, cereals - Consume only well-cooked vegetables that are tender enough to cut with a fork and canned fruits canned in their own juices (not in syrup). 6. Avoid gas-producing foods such as artichokes, asparagus, broccoli, cabbage, cauliflower, Brussels sprouts, green pepper, peas, lentils, beans, onions, apple, apricot, banana, melon, and prunes. - Sugar substitutes can also contribute to gas. If you are sensitive to lactose, choose lactose-free dairy products. Also avoid drinking through a straw, chewing gum, and drinking carbonated beverages as these can also contribute to gas. 7. Avoid meals that are too heavy such as those with dense gravies and sauces, large amounts of cheese, oils, and grease - Full fat dairy products, poultry skin, and red meats are also more significant sources of fat. 8. Be sure to eat slowly - Eating to quickly you can contribute easily to digestive discomfort. Small frequent meals are important to promote better digestion and allow your body to handle small amounts of food at a time. 9. Keeping a food diary - Keeping a food diary is very helpful for those who have undergone gastric surgery. It is important to slowly introduce one new food at a time. A food diary may help you to assess your tolerance of a new food or meal and identify those that may be triggering pain, discomfort, or indigestion. Even though the food suggestions above are a guideline, everyone's body may have different sensitivities to various foods, and meals cooked with different oils, spices, etc. Be sure to communicate with your healthcare team if you experience anything unusual. It is also very important to seek the advice of a registered dietitian during this time to ensure that you are able to meet your nutritional requirements for healing.